"An Honor Song, with Expressions of Gratitude"
Your craftsmanship in constructing a custom flute is truly amazing, but I am not totally surprised because I know yours and JoAnn's heart and spirit have been blessed by the Creator. 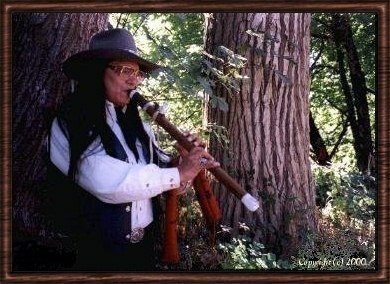 Anyone can make a pretty "one of a kind" fancy flute, but not all can have the Creator’s blessing in the finished work. I have found that a "sincere and honest quality flute maker" is hard to find, that create, not only a fine hand crafted wood instrument, but deliver the friendly and compassionate service as you, yourselves, do. When we called on you to help a friend in need, you two were there instantly. This friend, who you probably recall, had an unfortunate incident where his performance "C" flute was stolen from backstage at the venue he was performing in during his Albuquerque, New Mexico show. He needed help as soon as possible and we knew you would come through with fairly quick service, which you did. The next day, and to our surprise, he received a "C" flute from you to continue on his tour. Not only was that fast, but that was a very kind and helpful action on your part, one which was more than appreciated, and far above the "call of duty" in the flute world. And, not only this, but you also completed my own personal flute, which I am more than happy with, in record time and in plenty of time for my upcoming recording session. But, aside from your great service, it is evident that your custom flutes are spirit-filled and it shows ... it shows by their beautifully spiritual and healing sound, which project what the maker is all about. 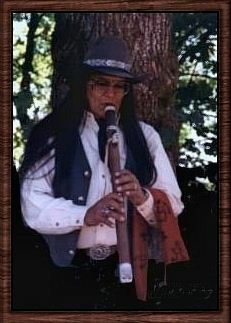 Jeff, I have all the confidence in the world that your instruments will take my upcoming Native American music CD to new heights, because of these blessed spirits that reside in these wonderful flutes, the same spirits that reside in you. I know first hand that you are, not only the finest flute maker in Oregon, but one of the finest in the United States. You are an honorable man, and it is an honor to play your flutes.